Hopper Capacity: What is 'Hopper Capacity'? Pure hardwood is the fuel for Traeger's signature flavor. Traeger owners and BBQ enthusiasts agree that wood-fired flavor is what they love most about their grill, because it simply tastes better than charcoal or gas. Real wood, real flavor -- every time. Taste the Traeger wood-fired difference. Let our experts help you find the Traeger that’s right for you! Why Buy Traeger From BBQGuys? ✔ Let Our Experts Find The Right Traeger For You! Grill, smoke & monitor your Ironwood wirelessly using the built-in Traeger WiFIRE controller & smart phone app! Grill, smoke & monitor your Traeger Pro wirelessly using the Traeger smart phone app! Grill, smoke & monitor your Timberline wirelessly using the built-in Traeger WiFIRE controller & smart phone app! Their WiFIRE control system allows grill aficionados to check on temperature and grill time directly from their smartphone. Smoke Science technology ensures amazing smoke flavor with every cook. 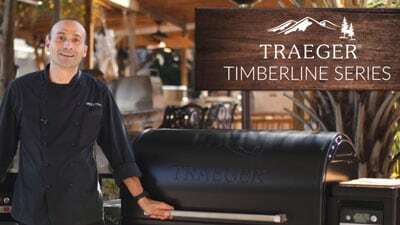 Traeger’s commitment to excellence has made them one of the most respected names in pellet grills, and the quality and ease of smoking meat on a Traeger pellet smoker are impossible to deny. Superior Taste- Traeger premium wood pellets pack a powerful flavor punch. Whether you enjoy a sweet cherry, savory mesquite, or traditional pecan, Traeger has a flavor that will satisfy any craving. Made in the USA and guaranteed to be 100% natural food-grade hardwood, Traeger’s pure pellets infuse your food with amazing wood-fired flavor. Versatility- Traeger pellet grills and smokers make cooking simple, providing unparalleled cooking options. Whether you need to sear a steak or BBQ ribs low and slow, Traeger has you covered. The heat retention and even temperature of a Traeger grill make any cooking method a surefire success. Ease of Use- Traeger brings the phrase ‘set it and forget it’ to another level. Simply set the grill to your desired temperature and walk away, sure in the knowledge that your grill will remain at your set temperature for as long as you need it to. Consistency- With no need to babysit, Traeger smokers convection-style heat will cook evenly every time, bathing your food in flavorful smoke. Drippings and grease are channeled into a drip tray, eliminating flare-ups and keeping direct flame off of your food. You can count on your Traeger grill to give you consistency you can count on cook after cook. Traeger Timberline- With built in WiFIRE controller and smart-phone app, you can rest easy knowing that your food will cook only to the desired internal temperature, and your grill will alert you when it is perfectly cooked. Traeger Pro Series- Available in sawhorse or traditional bbq look, you can enjoy an incredible versatility of cooking options of Traeger Pro Series pellet grills. Traeger Ironwood Series- Traeger brings the sawhorse style barrel smoker to a new level in the stylish Ironwood series, complete with WiFIRE technology and downdraft exhaust for even more efficient heating and smokey flavor. Traeger Competition Series- With double the grease management capacity of other series and an enormous 43 pound capacity hopper, you’ll be able to feed any amount of people with the same Traeger consistency. The Traeger XL can cook up to 12 chickens or 16 racks of ribs at one time. Traeger Town & Travel Series- All of the same great convection-style heat and cooking consistency that you love about Traeger Grills, in a compact and convenient size.